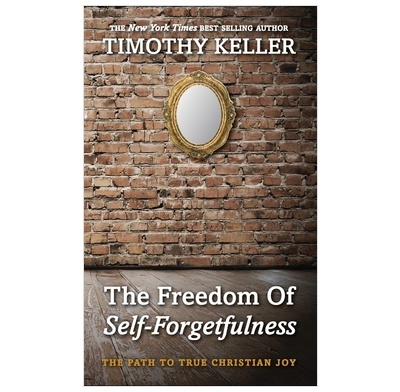 A short book by Timothy Keller on the path to true Christian joy, self-forgetfulness. The Freedom of Self-Forgetfulness is a little gem of a book. It can be read in 30-40 minutes and helps us to consider how busy we are measuring up all of our words, actions, looks and responses to both our own standards and to the standards of those around us. I've been really challenged to think about how God is concerned about where my heart and motives are, and encouraged to consider that God loves me for who I am, his child. I would highly recommend this book. The Freedom of Self-Forgetfulness is a little gem of a book. It can be read in 30-40 minutes and helps us to consider how busy we are measuring up all of our words, actions, looks and responses to both our own standards and to the standards of those around us. This is exhausting and can fuel either low self esteem or high self esteem. Through considering Paul's words to the Corinthians we are called to gospel humility - which is not thinking of ourselves more or less, but thinking about ourselves less. All that really matters is what God thinks of us. He is the one with the right standards and he is the one who will one day judge us. For those of us who are saved, we can know that God loves us and accepts us for what Jesus has done for us on the cross. God loves us as his own children and this isn't altered by what we look like, what others think of us or even what we think of ourselves. If we can live by this truth, our lives will be transformed. I would highly recommend this book. An easy read. Makes a lot of things make sense. I have really appreciated this book; reading it many times. It is very practical but comes at the subject of self image in an entirely new Biblical way. Although small, this book contains a whole Tim Keller sermon. and will be helpful to anyone who feels crushed by others' opinions of them, of even by their own "self-opinion". The book is also suitable for giving to Non-Christians, with helpful illustrations and real life examples, including Madonna. But you would not need to be a pop music fan to appreciate that particular example; anyone could read with benefit.